The duality of Padmé. Or I guess, given how much Queen’s Shadow loves acute accents, should that be dualité? Although it has come in fits and starts, Disney’s total reboot of the Star Wars canon—five years after it began in earnest—is still decidedly light in fleshing out the events between the prequels. So E.K. Johnston’s new novel promising to reveal Padmé’s life as she transitioned from Queen to Senator of Naboo seems like a potential hotbed of canonical discoveries. Queen’s Shadow is not that novel. And that’s actually a really, really good thing. In this “new” (is it odd to feel like all this Disney Star Wars is new, half a decade into it?) era of Star Wars storytelling, where anything and everything—from a single aside in a comic book to the grandest events of a Star Wars sequel entry—is considered canonical, there’s been an underlying feeling sometimes that the primary thrust of media beyond the movies exists first and foremost as a list of Star Wars facts to be collated and archived, and new stories second. While the very best of these stories—whether it’s in the comics, books, shows, or otherwise—manage to deliver both facts and a compelling narrative (like Johnston’s prior Star Wars work in the Ahsoka novel), getting to learn new details and stories behind and around the events of the Star Wars saga is still vastly appealing to many. As Queen, we learn Padmé feels restricted by tradition—not just at a political level, but an emotional one, leading to a painful reservedness. But aside from some intriguing shoutouts here and there—connections to the Naboo-bound events of Battlefront II get nods, as does Padmé’s eventual relationship with Clone Wars characters like Rush Clovis and Mina Bonteri—Queen’s Shadow is not particularly interested in treating these connections as its primary events. It’s not even particularly a novel with a grand story of its own—in fact, very little really happens, in that regard. First and foremost it is deeply entrenched in Padmé’s journey, both literally as she navigates her career change (and a move to Coruscant), and figuratively, as she finds herself having to rapidly transform as a person, from the stoic and distanced royal we meet in The Phantom Menace to the charmingly bold Senator we find a decade after in Attack of the Clones, and later expounded on in the Clone Wars animated series. We get some insight into the odd world of Naboo’s royal elections to please intrigued factoid fans—as Padmé and her handmaidens are scurried away in the final weeks of campaigning to avoid being seen as a political tool to be waged by potential members of the planet’s legislature—and the archaic traditions that surround the position of Queen. But we learn those traditions in order to explore how Padmé feels about growing out of a role that defined a fundamental part of her young life, and what it means to her that she is no longer a figurehead bound by ancient rules. Especially when her replacement, Queen Réillata, surprises her with an assignment to become Senator for the Chommell sector. Queen’s Shadow gives us the story of how Padmé transformed to the forward-thinking leader we meet in Attack of the Clones. Here’s Portman in that film along with Rose Byrne as Dormé. It’s actually here that Queen’s Shadow’s most interesting character work for Padmé begins in earnest. It turns out haughtily showing up on the Senate’s doorstep as Queen and demanding planetary aid under the threat of destabilizing Valorum’s Chancellery did not leave Padmé with the best impression among the Senate. So when she shows up in her new capacity, she finds herself beset on all sides by senators circling like sharks, looking to exploit her inexperience and a media lambasting her for her past focus on the interests of Naboo and Naboo alone. If Padmé’s faith in the Republic as a political institute wasn’t completely shattered in The Phantom Menace, it is in Queen’s Shadow, and that loss of faith serves as a freeing catalyst for her to begin navigating both her own political acumen as an activist senator, and to see who she really is beneath the layers of Naboo couture and ceremonial makeup. And that’s combined with the stark realization that she has to fundamentally rework who she is as a person after years of emotional reservedness, and what that means to her. 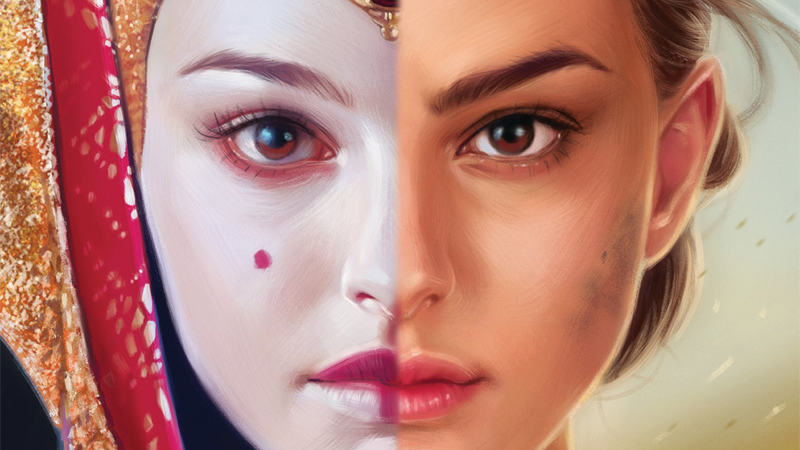 Making Queen’s Shadow deliberately the story of Padmé brings with it the fascinating story of her Handmaidens. We already knew that, despite no longer being Queen, Padmé kept her retinue of advisers-slash-decoys-slash-bodyguards as Naboo’s Senator—after all, Attack of the Clones opens with one of them, Cordé, being blown up in an assassination attempt. And likewise, with Padmé it is the emotional journeys of these characters that matter the most in Queen’s Shadow, even as it reveals moments and tidbits about their training and service, and watches Padmé’s entourage expand and contract as their duties to the Queen’s office comes to an end. The Queen’s shadow. But who’s casting it? That’s Portman on the left with lookalike Keira Knightley (Sabé) on the right acting as Queen. While all of her Handmaidens are important to the novel to varying degrees (Queen’s Shadow truly has more diacritics than you can shake an acute accent at), Sabé in particular—the Handmaiden famously portrayed by Keira Knightley in The Phantom Menace, her first big blockbuster role—gets a major focus in Queen’s Shadow. And, as a smart mirror with Padmé, the novel is interested primarily in who Sabé is as a person rather than her place within the canon of Star Wars (although there is an interesting allusion to that, as part of a flash-forward that takes us to Padmé’s funeral on Naboo at the end of Revenge of the Sith, that’s ripe for more exploration). Sabé’s journey is really one of self-discovery, as she balances the potent and intimate relationship she has with Padmé—as both her confidante and her double when the need for that role no longer entirely matters—with growing feelings for a Naboo Royal Guard Captain named Tonra (who accompanies Sabé on a mission to Tatooine that separates the Handmaiden from her Senator for a good chunk of the novel). Sabé’s arc is a rare one for Star Wars; it explores the idea of love not necessarily just in explicit terms of romantic passion (although the novel does hold allusions that Sabé is either bisexual or pansexual, a welcome diversification of the Star Wars galaxy) or as familial bonds, but one that attempts to reconcile the contrasting diametric of duty and friendship that are born out of the weirdly involved traditions that forge both Queen and Handmaiden alike on Naboo. If the title of Queen’s Shadow is the specter of Padmé’s actions in Phantom Menace catching up to her duty as Senator, it’s equally a specter cast over the lives in Padmé’s immediate circle, and how those characters, especially Sabé, embrace it as part of themselves. Once again, Sabé and Padmé as Padmé and Sabé. So yes, you could skip Queen’s Shadow if your primary engagement with Star Wars novels is the factoids and revelations within them—the trivia meat that fleshes out the ephemera of the galaxy far, far away, and further contextualizes the trajectory of that grand Skywalker saga. But, one or two passing mentions of a little boy from Tatooine aside, Queen’s Shadow’s first and foremost focus is on Padmé as a person, before it is Padmé as a walking Wookieepedia entry. Even if you see it as a book that explains how the Padmé we meet in Attack of the Clones’ earliest scenes is the same as the young woman we left holding up that giant disco ball at the end of Phantom Menace, it is not about the facts of that transition, but the emotionally volatile journey Padmé goes on in the process. It’s a reminder that for all the facts we have, we still know so little about the events of Padmé’s life outside of the prequel movies. She’s a fascinating character worthy of much more attention—not just to see those details come to life, but watch her courtly arc from defiant yet reserved Queen to shrewd, adventurous politician truly shine. Hopefully, Queen’s Shadow is just the beginning, even if it’s taken us 20 years to get there.